Author Ken Turner's value estimates are particularly interesting and, in most cases, would be fairly accurate today. Perhaps prices have dropped in the intervening 28 years and come back to where they were in 1986? Kenneth E. Turner (1928-) ran an antiques store called The Cobweb at 1361 Malvern Road, Malvern, Melbourne, and wrote several articles and books on collecting (but, apart from this article, no others on typewriters). 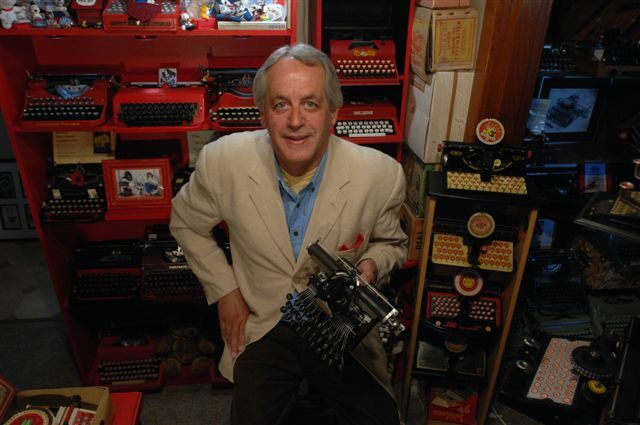 Typewriters, nonetheless, sparked his passion for antiques and led to him opening his store in 1975. It no longer exists. 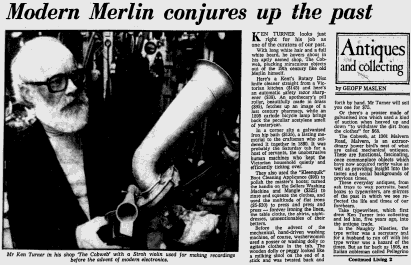 A two-part article and photo of Turner which appeared in The Age in August 1980 can be seen here. Thanks for posting that very interesting article, Robert. It provides a useful general introduction to beginners like me for those older vintage typewriters. The prices are interesting, altho in the weird world of eBay I have seen them run up to at least four times Turner's values. Also of course, within any make prices depend on scarcity. For example my Oliver 9, of which I believe half a million were made, cost much less than the minimum $300 in Turners list. I enjoyed reading this article very much - thanks for taking the time to scan and post. I met Ken Turner several times during the 80's when he used to come into my repair shop with some old machines to fix. He once brought in an Oliver that had a shifting problem but was very reluctant to leave with us. It was only when I assured him we would not steal it and giving him a proper workshop receipt did he consent to have it fixed. He was very happy when I rang him some time the following day with the good news, we won his trust and he later brought in some more portables. I went to his shop in that arcade, it was one of those large areas were many antique dealers displayed their goods. I was never able to buy a typewriter from him but I did buy a pocket chess set which I still have to this day. I gradually lost touch with him after he closed his shop and later his phone number changed.